Thanks to those who voted on my book cover poll. Despite my husband saying he liked the original covers, the overall results suggest I go with the new covers. And here they currently are (operative word – *current*). As I move into another editing phase on Blue Daisies a lot of thoughts are turning me towards others WIPs, which is a good thing also. 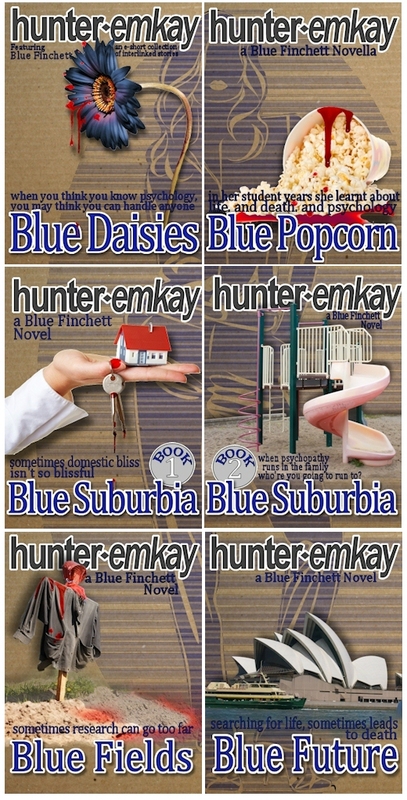 Consequently, I have a rough idea for Blue Popcorn, and I’ve taken the drastic decision to split Blue Suburbia into two books – the themes and conflict points were too many to hold within the one book, and the story has a natural cut off point allowing for this to happen. This means that much of the 50,000 or so words already written on Blue Suburbia will need to be revisited, and so will the whole outline, but there may be a little recoverable from what I’ve worked on previously. At the moment I’m working with a house-bound daughter (the weather is cold and wet) on her junque journal which is slowly documenting our family holidays in both words and art. It’s fun, but as I’ve found at any time I go off on a creative pursuit, lots of ideas and thoughts towards my writing also have a casual way of inserting themselves as little niggles. Some more niggles arrived when I finally started reading my next writing craft book on the huge To Read pile – “Save the Cat”. It’s brilliant, by the way. Even for non-screenwriters. Suddenly I realise that I don’t have some Save the Cat scenes when introducing characters I want people to care about. I’ve also been working on loglines for some of the books, but am not completely happy with them. They’ve gone on the mocked up book covers so far, however. Still big WIP. So, a couple of the shorts in Blue Daisies still need some deep rewrites to include more characterisation, and possibly a cat to save.